Marcus F. Ru. 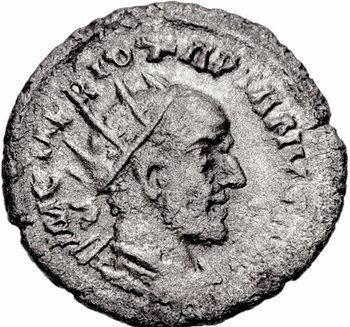 Jotapianus was a usurper in the eastern provinces of the Roman Empire during the reign of Emperor Philip the Arab, around 249. He is known from his rare coins and from accounts in Aurelius Victor, Zosimus, and Polemius Silvius. He led a rebellion started in Syria, towards the end of Philip's rule, against the increase in taxation ordered by the rector Orientis Priscus, Philip's brother. He made Antioch his capital, but the rebellion came to an end when Jotapianus was killed by his own soldiers, possibly during Emperor Decius' rule. All coins issued by Jotapian are antonianii, all of them show a crude design, and all of them have a VICTORIA AVG reverse, celebrating a victory of the rebels over Philip troops. They are also very expensive.